KATHMANDU, May 2: With one of the major ruling coalition partners, Rastriya Prajatantra Party (RPP), withdrawing support from the Pushpa Kamal Dahal-led government, the government is tottering on the brink just ahead of the local elections. Following internal party disputes, the third largest ruling-coalition ally on Monday decided to quit the government, pulling out four cabinet ministers and state ministers. A central working committee meeting of the RPP Monday decided, however, to support the election process and vote for the constitution amendment bill, said party leader Jayanta Chand. "Our party, however, will protest from the opposition benches against the impeachment motion filed against Chief Justice Sushila Karki," he said. 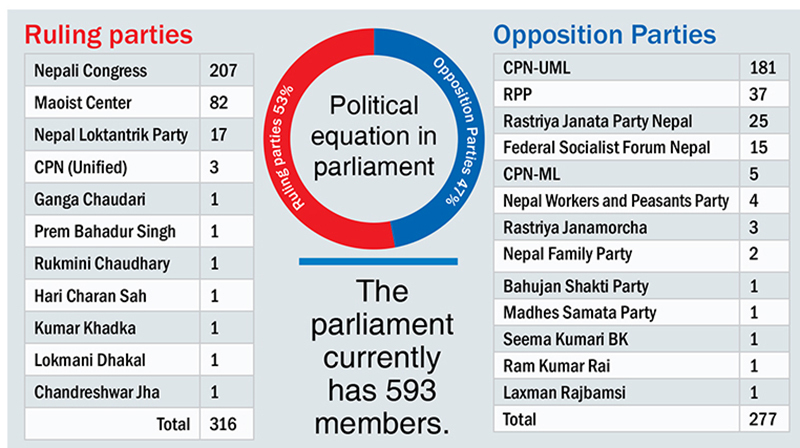 After losing the support of the RPP, which has 37 lawmakers in parliament, the government commands only a slim majority. The government has the support of 316 lawmakers from Nepali Congress (NC), CPN (Maoist Center), Nepal Loktantrik Party (NLP) and some other fringe parties. NLP, which has 17 seats, has been supporting the ruling coalition without joining the government. The party is also mulling to quit the government out of dissatisfaction over the impeachment motion against Chief Justice Karki, among other issues. If the party decides to withdraw its support, the Dahal-led government is almost certain to fall into a minority. "We are also not satisfied with the government and our parliamentary party meeting will come out with a decision to quit the coalition on Tuesday," Chief Whip Yogendra Chaudhary told Republica. He said that some influential leaders of the party are pressing for withdrawal of support after the government took major decisions without consulting the NLP. However, some ruling party leaders claimed that NLP is likely to join the government if Prime Minister Dahal offers the post of deputy prime minister with the home ministry portfolio to the party's chairman, Bijay Gachahhadar. Following the resignation of Bimalendra Nidhi on Sunday, the home ministry remains without a head. Dahal was elected prime minister in August with the support of the NC, the largest party in parliament, and various Madhes-based parties, along with some fringe parties . The two ruling allies NC and the Maoists had agreed to hand over government leadership to NC President Deuba right after the local polls. The CPN (Maoist Center) had registered a no confidence motion against then prime minister K P Oli immediately after quitting the UML-led government.